We hope you find the information on this page useful. The names of different cuts of meat are regional in nature. Some of these cuts have other names that you might be more familiar with depending on where you are from and are too numerous to be listed here. To see our Price List or responses to Frequently Asked Questions, click on the links. An oven roast, such as a top or bottom round roast is a roast that is cooked in the oven until it reaches the desired internal temperature (rare to medium:140-160 degrees F). It is then immediately pulled and sliced thin and served with gravy made from the drippings. 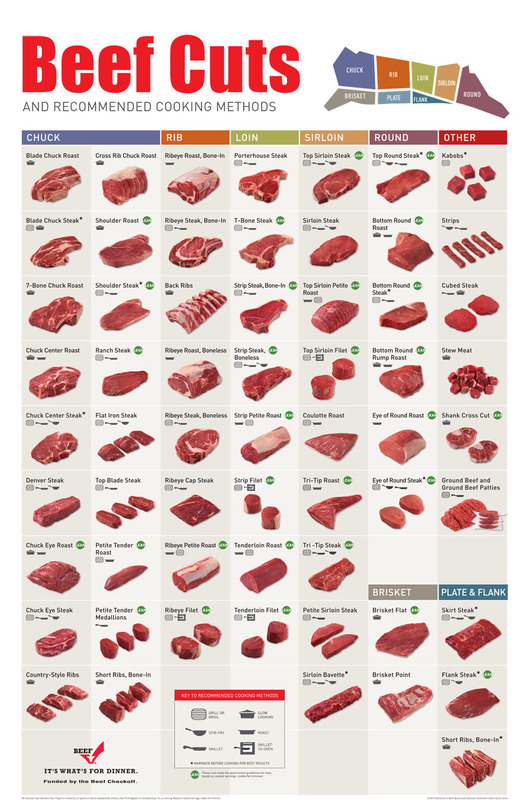 These cuts of meat are ideal for slow cooking methods such as a slow cooker or at low heat in the oven. This cut is very lean and has a fine texture while offering great flavour. It is best cooked at a low temperature to avoid being tough. However, just like most roasts, that is the preparation method most commonly used in order to have drippings for gravy. This cut is quite tender and very easy to cook. It doesn't require liquid during the cooking process. Simply season, heat oil in a pan and sear the roast on all sides to seal in its moisture. Then place it in an over set to around 250 F until the internal temperature reaches 140 F for medium-rare or 155 F for medium. This cut is exceptionally tender and full of flavour due to the amount of marbling throughout the roast. It is very difficult to find a true Prime Rib roast in your local supermarket (see the next paragraph for more information). Typically, you need to ask for it to be special ordered for you and that is very expensive. Our Prime Rib is the real deal and it sells very quickly so if you want to ensure you don't miss out, contact us today. 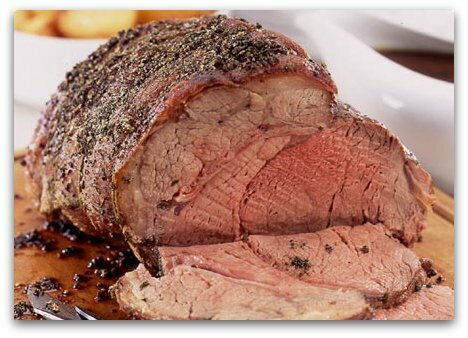 In your supermarket the term 'prime' rib does not necessarily indicate a rib roast is prime grade. 'Prime' is the official government designation of grade and few supermarkets display this elite grade of beef because of its high cost. The tenderloin is the gold standard of cuts because it is so tender and rich as indicated by the price per pound. It is very versatile and easy to cook. This cut of meat is very flavourful and extremely tender. Some chefs consider it to be a more desirable cut than a tenderloin. All this steak needs is a bit of seasoning and it's ready for the grill. Prime Rib is also known as a Ribeye. The information given under Prime Rib Roast applies to the steak. Prime refers to the grade of the meat vs. it truly being the prime cut of meat. The marbling in the meat along with the bone are what makes the Prime Rib steak so delicious and tender resulting in it being extremely popular. 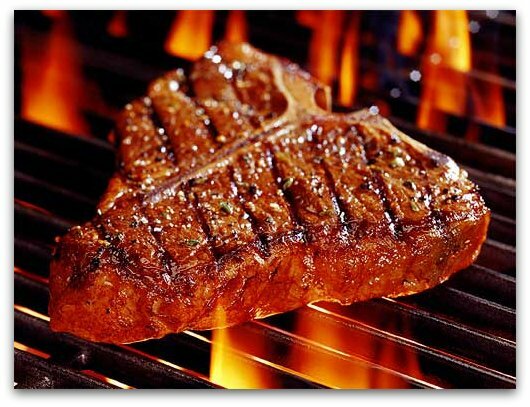 T-bone steaks are an outstanding steak. They are very tender and tasty, suitable for the grill or for broiling. The New York strip steak is on one side and the tenderloin or fillet mignon is on the other separated by the T-shaped bone. Top round or inside round is what this steak is called in Canada. This is a very lean steak so it is delicious when tenderized and marinated for a while. This approach only serve to enhance the flavour. It is a great grilling, broiling and pan-searing cut and delicious in stir-fry. If you are looking for a lean option, this is the one for you. Top sirloin steak is lean, full of beefy flavour and makes for a fantastic grilling steak. It is the best of the sirloin cuts and extremely popular. Chuck steaks are often overlooked; however, they are delicious and can be very tender. It does require a bit of marinating and can't be overcooked but when done correctly, this is an excellent option. It is great for stir-fry as well as a lot of other types of recipes. When our customers try our chuck, they always order more the next time. Back ribs are the portion of the rib that is peeled away from the prime rib or rib-eye. There is not a lot of meat on the back ribs but what there is, is very tasty. Short ribs are one of the most flavourful cuts of beef. The ribs used for short ribs come off the meatier portion of the plate (ribs) extending into the cross rib and excluding the back rib which comes off the prime rib section. They are great when braised slowly. We appreciate your support and thank you for taking the time to like and follow us on Facebook or Instagram and let others know about us.